The Writing Centre has moved to HL 104. We are on the ground floor, near the computers. Writing doesn’t have to be a lonely and isolating chore requiring endurance and fortitude. 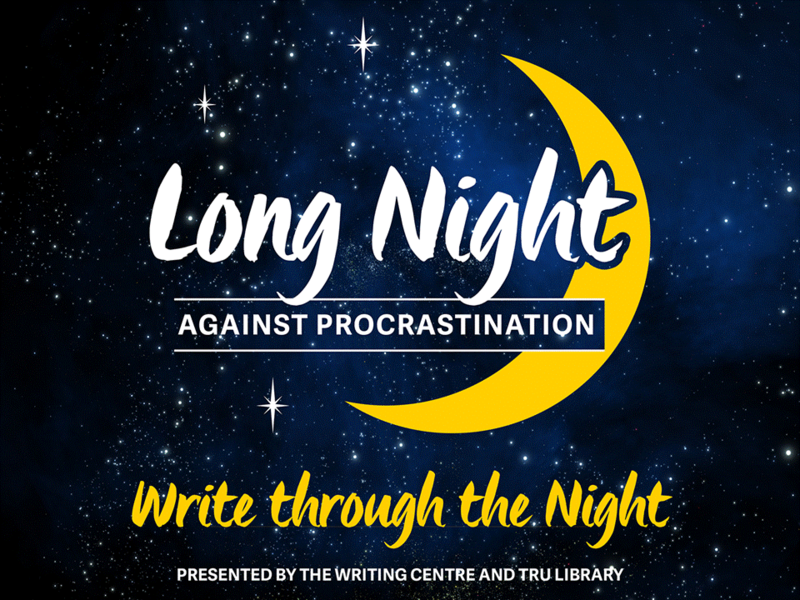 Attend Long Night Against Procrastination on March 21 from 8:00pm-8:00am and put a dent in your assignments by joining a community of campus writers and academic support services. Whether you are an undergraduate or graduate student, the Writing Centre can assist you by providing feedback on your writing. Students may receive help with any stage of the writing process: assignment interpretation; generating ideas; creating an outline; lower-order concerns such as sentence structure, grammar, and punctuation; higher-order concerns such as clarity of ideas and soundness of arguments; research and citation; and revision and editing. Our goal is to help you become a better, more confident writer. There are several types of tutor opportunities for students in the Writing Centre: work study, honorarium, and volunteering. We strive to maintain a positive, safe, supportive environment, and we take student confidentiality seriously. Therefore, we do not normally disclose information about a tutoring session without the permission of the student. Discussions and session information will be kept confidential unless a tutor believes a student may be at risk of harming themself or another, or there is an alleged violation of TRU’s Academic Integrity Policy.